On the beachfront; 25km from Playa del Carmen with shops, bars and restaurants. Junior suites have 1 king-size bed or 2 double beds, air conditioning, cable TV, coffee-maker, iron, ironing board, whirlpool, mini-bar restocked daily with soft drinks, spirits, beer and water, full bathroom and balcony or terrace. All rooms include concierge and butler service with champagne check-in, pillow menu, pool service providing towels, suntan lotion and books. This all-inclusive & adults only resort in Riviera Maya offers many facilities to practice various sports: fitness centre with machines; aerobic, dance, yoga, tai chi or spinning rooms; outdoor shooting facilities, archery, tennis, basketball, volleyball, beach volleyball, table tennis, darts and billiards. As for water sports: catamaran, kayak, introduction to diving in the pool, snorkeling and water polo, and an 18 hole golf course. There is an impressive Spa with thalasso pool, fitness room, steam room, whirlpools, massage and beauty treatments. All Inclusive. 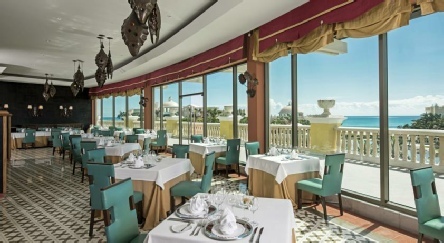 The Grand Hotel Paraiso has four restaurants, a five star buffet, five bars as well as 24 hour room service. An elegant hotel boasting some dazzling design features, the Iberostar Grand Hotel Paraiso is right on a glorious white sands of Paya Paraiso beach. Ideal for honeymooners with its child-free atmosphere and romantic vibe. 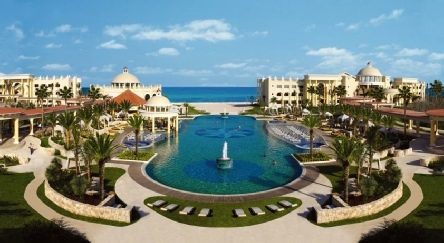 2019 package holidays to the Iberostar Grand Hotel Paraiso, Mexico Prices are per person based on two sharing.